Today I'm sharing with you my third and last outfit from Florence. 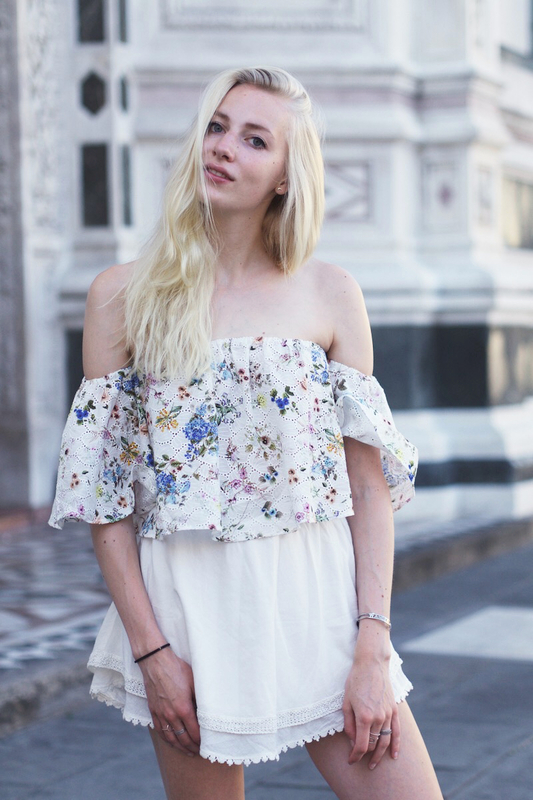 During our last day of exploring this incredibly beautiful city I was wearing a romantic white skirt and flower-printed off the shoulder top. When we walked across Piazza di Santa Croce in the early morning - which was located only one street next to our Airbnb home - we decided to take some shots of my look of the day in front of the impressive church. Because it was still early I have quite a morning face on the pictures (although I tried my best to look awake), but it was such a big plus that we had no problems with tourist crowds standing in our way while taking them. What do you think about the result? Happy Thursday! This is such a cute dress, love it! I think the fact that there are no tourists in the pics makes up for the early morning, haha! I love this! And it's perfect for Spring as well!